Type 1 Diabetes is commonly diagnosed during adolescents because the pancreas is unable to make any insulin. Only about 10% of people have this type of diabetes, and it always requires the use of insulin. Type 2 Diabetes is defined as a chronic illness when the body responds poorly to insulin or is no longer able to make enough insulin for your body. The key to managing this disease is a healthy balanced diet with adequate carbohydrates, exercise, and medication (if prescribed). It is important to take this disease serious to prevent other disease conditions. Common complications of poorly controlled diabetes are; neuropathy, kidney disease, loss of eyesight, poor wound healing, erectile dysfunction, and amputations. This a critical point where you can STOP progression to diabetes. There are many ways you and your dietitian can target this pre-disease state with proper nutrition. Ask your doctor to test your blood sugars at your annual check up to see if you have elevated glucose levels. 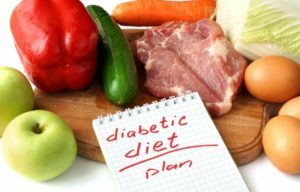 Schedule today to create your personalized diet plan to prevent complications from Diabetes.